Hyping the Camino: What Am I Missing? I have a sense that we´re missing a lot of the life and culture of the cities in which we are staying but which we are not totally experiencing. There´s a whole other life happening in these cities after we tired aching peregrinos hit the sack. Last night we walked down to the main plazas in Astorgo but we were still too early, at 6:30pm, to be served any sort of a meal so we just hit the tiendas for some cheese, Iberian Black Foot Pig Ham (whatever it is and whatever it is costs about 59 Euros a kilo!) for Dayton, bread and wine. The plazas were starting to teem with locals and it would have been interesting to sit out and observe the Friday night happenings but tired, cold and hobbling we went back to the alberque and shared our goodies, chatting with some of the other pilgrims and went to bed early. Actually, this is no different than life back in London where the only thing I know about the night life is from picking my children up when the bars close. Today was a fairly easy walking day, even with the swollen legs, shin splints and wrecked ankle. 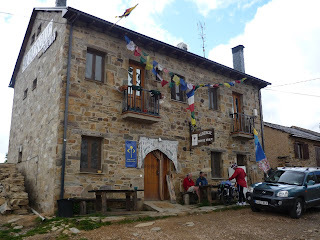 We walked from Astorga to Rabanal and got in three hours before the alberque opened so pressed on to Fonceban. From Rabanal to Fonceban we got a wonderful glimpse of our first spring flowers and fields of flowering heather. It was a really beautiful hilly climb. We would have continued on but the rain came and a bed and peregrino meal was available at Foncebadon so we seized the moment.